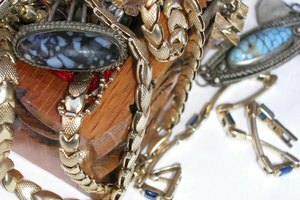 Costume jewelry is perfect for pulling looks together and creating fashionable statements. 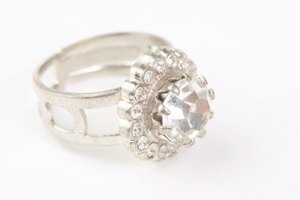 From rhinestones to silver appearances, protecting your jewelry in advance is key. You can prevent stones from miscoloring, and silver and gold from rubbing off, by applying protective coating. Here's how to do it. Prepare your station. 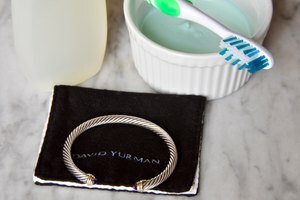 It's best to lay the piece of jewelry on a flat surface while it's spread out. Pour clear nail hardener into a separate container if needed. With the brush that was included with the polish (or a small paintbrush), start to apply a thin coat only to the chain itself. (This is the most important part, as it's prone to tarnishing.) Let it sit for 10 minutes, then turn over the chain and repeat the step for the other side. Take a look at the casing, or the holder, of the rhinestones or other beads that are being held in place. Apply a more generous amount around these holders, as they tend to tarnish even more than the chain. Allow to sit for 20 minutes. Pay close attention to the openings within the casing as well, but remember to avoid the stones. After all sets have dried, remove any excess with a wet paper towel. Do not use nail-polish remover at any time during this process. Absolutely do not paint over rhinestones or any other bead in the jewelry. This will change its appearance forever, and is generally not needed. If stones become damaged over time, it's usually best to replace them. 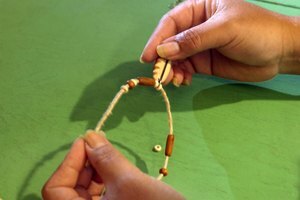 For wooden beads or other naturally created jewelry, apply a small amount of wood cleaner or polish diluted with water to enhance the shine.